Hello. I'm Ganga Rajaram, Centre Director of Mathnasium of New Westminster, your neighbourhood math-only learning centre. We help kids in grades Grades 2 to 12 understand math by teaching the way that makes sense to them. 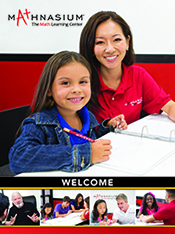 Mathnasium of New Westminster offers math tutoring, homework, and test help to students in the Burnaby, New Westminster, and Coquitlam communities. Our expert math staff is passionate about helping kids in our community improve and excel in math. We offer year-round, summer-only and short-term session based math programs. We are located in Royal Square Mall between Safeway and Starbucks. Power up your child this Summer! We offer summer math programs that are fun and effective with flexible scheduling. Call us at 604-553-7323 for early bird registration. Early Bird Registration is open now. Register before May 2019 to benefit from discount! Thank you so much , great learning, so much support, nice teachers , my daughter learn a lot. She is so happy. Makena is having an incredible experience and learning so much!!! Thank you! Ben really enjoys going and is learning so much! Great tutors, patience & knowledgeable. Mathnasium was very helpful to my son Derek (even though he put in minimal effort). Derek did better in math 10 because of the help Mathnasium instructors gave. Ganga and Ramesh do a great job with my son. They care about how he is doing and both he and I can feel this. This helps a lot with my son’s motivation and keeps him engaged and happy to come back. They know kids and tailor the learning to individual need. Great teachers and friendly staff. Clean facility. Only been at Mathnasium for a month but we like it so far. Friendly people and I think that our daughter is understanding math better than before. Great place & the instructors are extremely nice & has a lot of patience to their students. Holly’s math at school has improved and she is getting higher grades. Thank you. So far Morgan has felt like attending Mathnasium has been really helpful for her. It makes me so happy to hear because she would struggle so much with her math homework. It will be very interesting to see where her grades end up this year. My girls (Grade 5 and 6) attendend 6 months of Mathnaseum in New Westminster. Ganga and her team are competent, engaged and simply wonderful human beings. Their skills improved which we could also see in their grades. I continue to be full of gratitude for Ganga and Ramish. There patience, understanding and ability to work with our family goes above and beyond the call of duty. The time at Mathnasium has become a way of life. They have very competent and friendly staff that compliment the whole plan that is in place. Thank you very much ! My daughter’s attitude towards Math has changed within one month of sessions at Mathnasium. She has more confidence in her abilities and is eager to share her knowledge. My daughter enjoys learning with the instructors and has commented about how patient they are regardless of how many times they have to go over the same problem. Staff is very friendly. My child really enjoyed it. The instructor is very nice to my children & her attention to them is great! Patience, professionalism, kindness, interested and thoughtful are a few of the words I would use to describe our experience with the New Westminster Mathnasium location. Thank you. What is Your Child's Report Card Really Telling You?